Propaganda to support the Islamic Movement’s strategy comes from a variety of sources. “Moderate muslims” are one of the most dangerous groups which continues to be pushed to the forefront by well-meaning people as the “saviors” of this war. 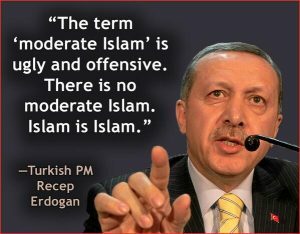 When “moderate muslims” discuss Islam and deny the legal requirement for muslims to wage war against non-muslims, they either lack an understanding of Sharia or they are lying. In Islam, muslims who do not follow the doctrine of Islam – sharia – are considered apostates and are subject to capital punishment. In the United States, “moderate” muslims are exclusively entrusted to “educate” local, state and federal leaders about Islam. Yet, over 17 years after 9/11/01, America’s leaders remain catastrophically unaware of the basic teachings of Islam. This speaks volumes about what “Islamic advisors” and the “moderate muslims” are actually teaching. Suit-wearing jihadi like Mohamed Magid, Sayyid Syeed, and Salam al Marayati – all Muslim Brotherhood/Hamas leaders – are warmly welcomed into churches, government offices, and public functions. Muslim police officers around the county train their fellow officers and their community that the problem is a “few radicalized” muslims. Yet, all authoritative Islamic law (sharia) obliges jihad until the world is under Islamic rule. Broward County (FL) Sheriff’s Deputy Nezar Hamze, who served as the Executive Director of Hamas doing business as CAIR in Florida, currently serves as CAIR-Florida’s second in command. Hamze is in Florida training Hamas/CAIR employees, and provided firearms training for the Darul Uloom mosque, located in Pembroke Pines, FL. So it is not surprising another jihadi was arrested in Broward County. On five (5) occasions between 7/15/18 – 9/ 17/18 Ismail posted step-by-step instructions on how to construct a bomb and other explosives in an internet messaging platform. Ismail posted support for the Islamic State at the same time he was being watched by the FBI. This last message referred to the Jihadi attack by Omar Mateen at the Pulse nightclub. The FBI reported Ismail was a prolific poster in the messaging platform system with over 1,500 posts in November 2018 in an Islamic state chat room. This chat room includes posts of ISIS news publications, instructions of dealing with explosives and also serves as encouragement to conduct Jihad. Ismail was well known to the FBI in 2010, when he claimed he was an al Qaeda solider while at a homeless shelter and threatened to “blow it up.” After he was insulted by a female he said, “we throw women like her in the ditch.” In 2010 Ismail discussed with an FBI source how to make a bomb with baking soda, metal and a few other items. In 2016, Ismail’s roommate James Medina was arrested in Aventura county (bordering Broward county) and is serving a 25-years prison sentence for 18 U.S.C 2332 a(a)(2) Attempted Use of a Weapon of Mass Destruction. Ismail and Medina lived together in Florida when Medina was planning to blow up a synagogue and Jewish school. Ismail knew of Medina’s plan to attack the synagogue and did not alert police. In December 2017, Ismail returned to the US from Pakistan and had 3 digital copies of Dabiq magazine in his possession, hadiths supporting jihad, al Qaeda training manuals and videos of jihadi operations. Tayyab Tahir Ismail understands sharia and has been educating others about sharia. When UTT teaches about Islam and jihad, we do so using only Islamic sources used in mosques and Islamic schools across America. If that is not good enough for you, listen to Tayyab Tahir Ismail or Omar Mateen or to Anwar Al-Aulaqi or any other Islamic scholars or jihadis who all want to establish Allah’s law (Sharia) on the earth – which includes America. All Islamic law defines Jihad as warfare against non-muslims and its obligatory for muslims to commit Jihad until Sharia is the law of the land. There is one Sharia and one Islam. UTT tells you the same truthful message the jihadi’s are telling. Will you listen? No one is eradicating the cancer. ….and so the body dies. I live in Florida, Islam is the problem, it has not changed and will not change to peace and love. Islam need to stay in islamic countries. Islam is growing in the USA, wake up America. The old days of the USA are “in God we Trust, God Bless You, Merry Christmas, Happy Hanukkah. God be with You, I can say and write what I want, land of the free, do no harm, no special work rules, workers are treated the same for the same pay, advancement is by skill, education for the advancement of the mind not the emotion, citizen pledge Allegiance to the USA, hand over heart to the flag, US law the law of the land,” the phrases keep growing by the day. More radical views from Islam are growing in south Florida and moving into Orlando and Tampa the the regional headquarters of CAIR. So sad. Local organizations need to do more to educate the threat of Islam. Islam is not a religion it is governance of people. All Muslims should be deported from the U.S. immediately! Why are they still allowed in our country? Do we have to have another 9/11 before anything is done? I don’t understand. We know they want to kill us all, so isn’t it our governments duty to protect us from these false-god lovers and kick them out? I think it is! John, the very first muslim, who while a student in high school, explained to me the eradicating process of “cancer in a body” that I understood her to explain as a country that they deemed to be seen as bad or “cancer infected”, all the while I am thinking this sounds awful as I realized she was speaking of our country as the target. So the comment above can be used in both situations. one wants to eradicate the kuffar unbeliever and the other is to use it to explain a doctrine hides as tolerant but has a warfare obligation that is dangerous. This article shows the plotters and now they need to name the source doctrine as it is spreading by legal jurists with a clever fake name and a silent agenda. The silent agenda to eradicate us. Maybe they are on to it since our security find the plotters. Looks like Mitt needs education about sharia law since he appears to be criticizing any concern regarding the movement to compare sharia as compatible with the U.S, Constitution, as they hide out as a religion and have an influence operation active within our country and government. I guess I make that comment due to his use of the word Islamophobia which is the biggest clue he has only the information the prescribed for non-believers and not many facts in my opinion. The information he should have is about the voting block of the OIC, all sharia-compliant countries, the terms of tolerance and justice according to sharia, slander laws to speak truthfully and the obligation of jihad. Resentfulness that Mitt refers to is a coordinated problem that sharia slander laws keep information out of public discourse….that is most dangerous especially when it is also keeping many in positions of decision-makers, media, and much of clergy clueless about the doctrine they support, which the adherent secretly know the term of jihad is warfare against non muslims to bring sharia and replace the Constitution. The last three lines of your article says it all it is nothing new as Admiral Lyons knew, ( a stunningly sharp mind) Winston Churchill knew and history. Mitt may not like Trumps style, but a style of uninformed got us to this mess and allowed the flow and may defeat a wall that has already allowed the U.S.to be invaded over many years to bring our demise.